It's time to clean the trailer up and figure out who to send the bill to later, says a Conception Bay South councillor. An abandoned, rotting trailer filled with drums of what appears to be hazardous material has people in Seal Cove worried. 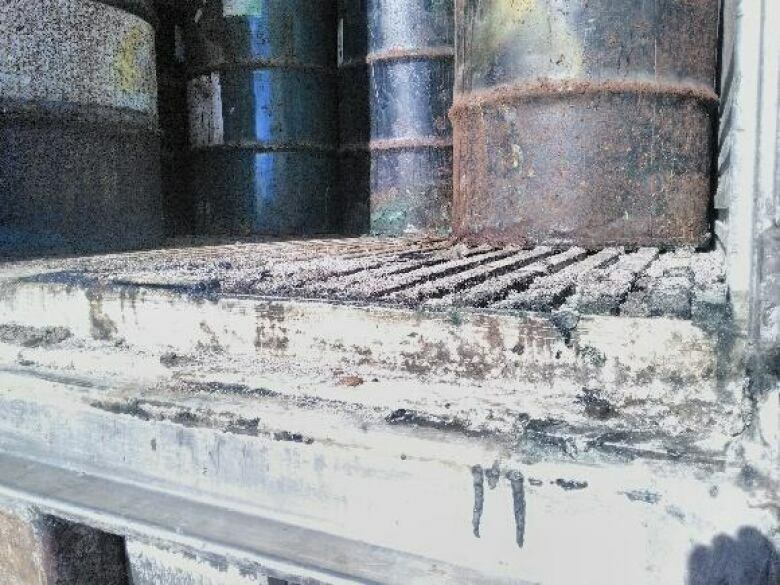 Resident Scott Parsons, who recently visited the trailer, says it's rusting, the legs are collapsing, and dozens of 45-gallon drums inside are mouldy and leaking. "It was filled right from one end to the other with 45-gallon drums stacked on top of each other," Parsons told The St. John's Morning Show on Thursday. 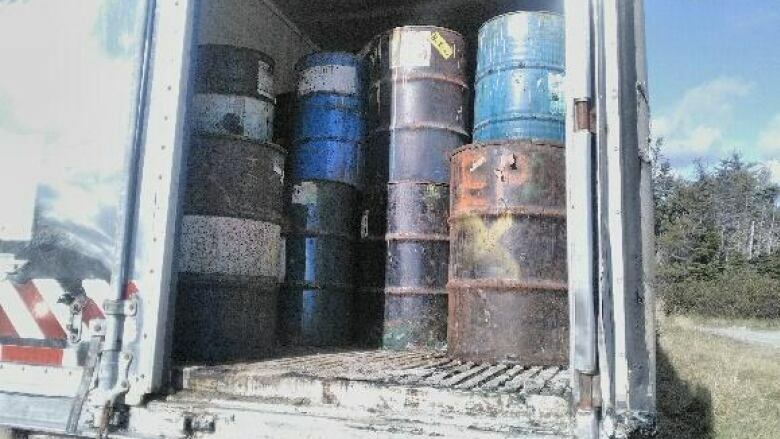 "When we opened it up the fumes were very, very strong and there was some sort of fungus growing on the bottom of the trailer and on the drums themselves," he said. 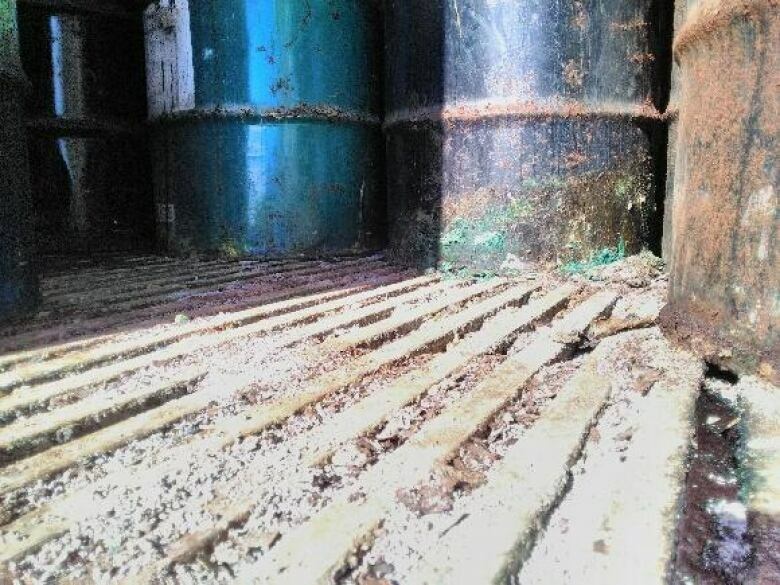 "The floor of the trailer was rotting out and the bottoms of the drums were rusting, and [there] appeared to be some seepage around the bottoms of the drums." The trailer has been in the area for years, say residents, in a few different locations. It's currently off a byroad called Daniels Road, which is the fire exit for Butterpot Park, Parsons said, at the top of a ridge on a hill on the way into Daniels Road. Part of it is resting directly on the ground. Parsons said politicians and first responders in the area are aware of the trailer's condition, but it's unclear who is responsible for dealing with it. The friend who brought him to the site has contacted local councillors as well as area member of Parliament Ken McDonald, who told him he's working on the issue. He also contacted the local fire department and the Royal Newfoundland Constabulary. "The Department of Municipal Affairs and Environment has engaged a professional to help identify any hazardous materials by determining what degree of sampling is needed to characterize the waste and to determine the safest and best environmental approach to waste removal from the site," the department told CBC News in a statement Friday. 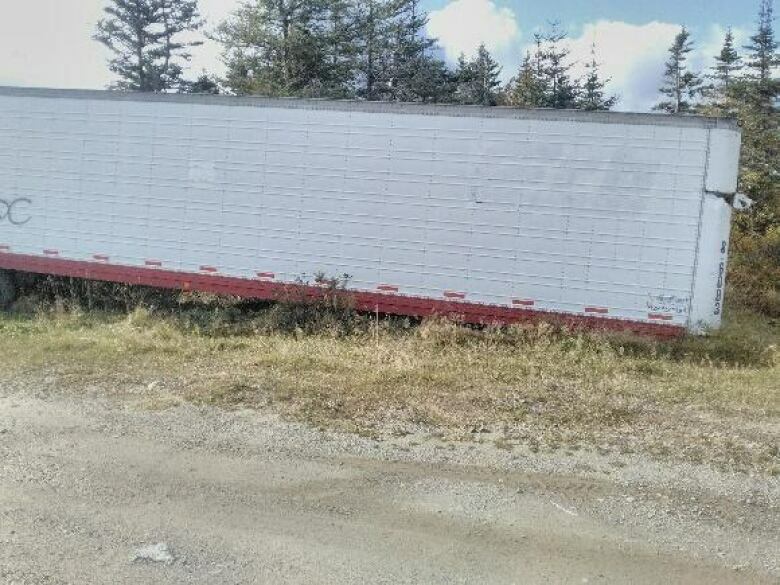 Service NL has been working on finding out who is responsible for the trailer, the department said. But given the potential for leakage in an area where many people use well water, Parsons wants to know why the trailer is still there. "Maybe a kilometre downhill from this trailer is Daniels Crescent. My daughter and my grandchildren live there, and there are dozens of homes that have dug wells," Parsons said. "If there's anything leaking out of this trailer there's a probability that some of this stuff might end up in their wells. So we're very, very concerned about it." Conception Bay South Coun. Kirk Youden has similar concerns. "I think it's probably better to err on the side of safety," Youden told The St. John's Morning Show on Friday. "Let's get that cleaned up before an accident happens." Council became aware of the trailer a few weeks ago through concerned residents, he said. Service NL told him they're trying to find out who owns the trailer, said Youden, who also wrote to the provincial government about the problem three weeks ago. He hasn't received a response. Youden said it's more important to get the trailer cleaned up than to figure out who it officially belongs to. "From our end we would like people with the appropriate expertise to just clean it up and worry about who pays for it later," he said. Parsons agreed, saying the focus on finding the trailer's owner isn't helpful. "I think the logical process here would be to remove the contents of the trailer and clean up, and then find whoever it is that owns them and present them with the bill." The town's research indicates that it sits in an area where the boundaries of Conception Bay South and St. John's come together with Crown land, he said, and there is also private land in the area. Youden believes the trailer is on Crown land. But even if the area isn't part of C.B.S., the area is popular with the town's residents for activities like hiking, dog walking and berry picking, he said. The town's fire department inspected the site and put a new lock on the trailer, he said, and erected snow fencing around it to warn people to stay away. But the trailer was unlocked when he was there on Sunday, Parsons said, and he's concerned it could catch fire or tip over as its condition deteriorates or the ground underneath it softens. 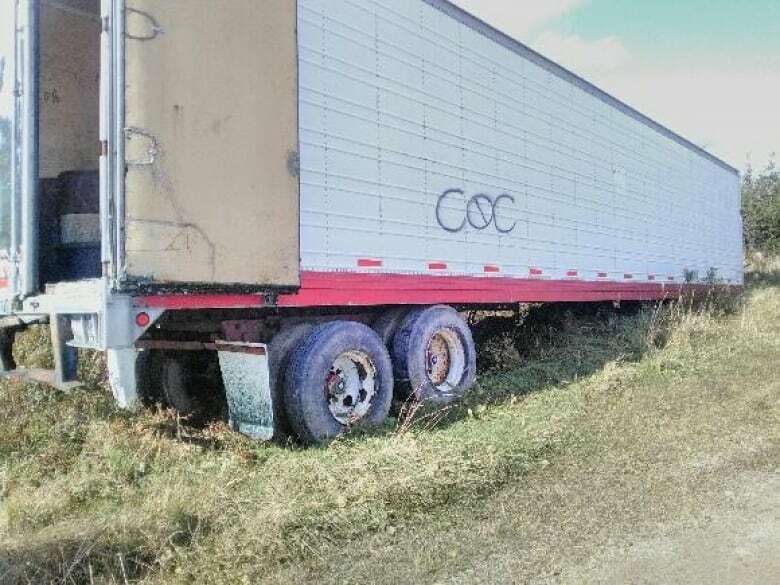 "If the trailer tips over and the contents spill out into the ground, it's going to cost a heck of a lot more to clean it up than it is now," he said. "The drums are somewhat intact, and if they send a truck up and move this stuff from a trailer to a rolling truck they could move the stuff out of there rather quickly. So I just don't understand why this trailer is still there."